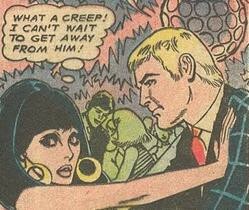 In a July 1968 edition of the recurring romance-comic feature “Sweet Mystery of Love,” the lovely Janice is set up with Freddy the unsmiling, single-minded creep. But is he really so creepy after all? Vintage comic book hoarder Sequential Crush abridges this strange and passionate story of love.